may I ask of you to sing a song for me? … be courageous! … very kind of you. In preparation for his visit to the U.S., and because he will not be visiting the cities in which these young people live, Pope Francis made a “virtual visit” with them. 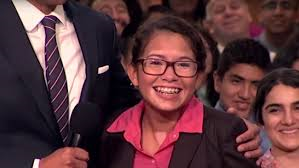 If you do not watch the whole piece – Chicago Teen Sings for Pope Francis – at least skip to minute 2:30. There is an hour long program on Friday at 10:00 p.m. on ABC. Set yourself up to watch it or set your DVR to watch it for you. Thanks for reminding me about the program on Friday! I believe the HS is showering us with love and grace and His presence with Pope Francis being here! We need to pray Divine Protection, which I’m sure he already has, but we need to be aware of it and thankful! Glad to see you haven’t forgotten us. We love hearing from you! BTW, it is September 1 – happy anniversary! Thank you for remembering our anniversary. I certainly did! Have a good day.